A delicious, full-flavoured Asian coleslaw which is both healthy and kind to your waistline. It requires a bit of preparation and soaking but once finished it will easily keep for several days in the fridge. The taste will improve when the coleslaw is left to stand for a while. The inspiration for this coleslaw comes from Japanese and Korean cuisines. Both Japanese and Korean food often includes a fair amount of sugar though. I only add a small amount of raw, untreated honey in place of sugar in any type of Asian-style food where sugar is otherwise used. When it comes to cabbage, my favourite type is sweet pointed cabbage. 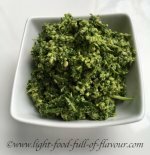 I love adding finely shredded pointed cabbage to my salads – love that sweet crunch you get when biting into it! Cabbage is also super-good for you – containing among other things highly potent anti-cancer and liver-friendly nutrients. As long as it is available, I buy organic cabbage. 1. Place the shredded cabbage, grated carrots, apples and chopped spring onions (scallions) in a non-metallic bowl. Add the cider vinegar and salt and mix thoroughly. Leave to stand for 1 hour – stirring the mixture every now and then. 2. After an hour, put a lid or a plate on top of the coleslaw and pour off the liquid. 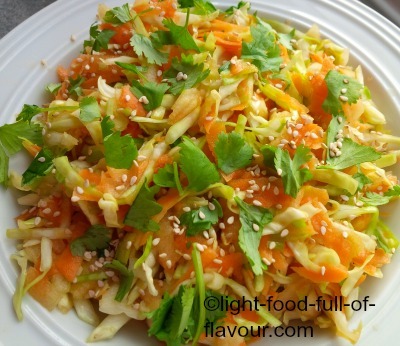 Mix together the lime juice, soy sauce, sesame oil, honey, garlic and ginger, season with some black pepper and add to the coleslaw together with the sesame seeds. Mix thoroughly. I eat most of my cooked food together with a raw salad to try to get as much nutrients as possible from what I eat – and to keep my weight in check by eating a lot of whatever salad I’ve made before eating anything else! This Asian coleslaw will go well together with a lot of different types of Asian-style food.